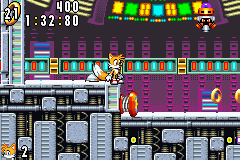 Cosmic Angel is the seventh named zone of Sonic Advance, though it is really Act 2 of the previous Egg Rocket Zone. This level is a space station with colorful lights in the background, and is the Egg Rocket's ultimate destination. Features include floating devices, gravity shifting, and more Badniks and pitfalls than the rest of the game combined, and also has the least Item Boxes out of all the zones in the game. Because Egg Rocket wasn't enough, Cosmic Angel is the hardest level in the game. Mirror - Pointy defensive robot that occasionally opens up to fire energy shots. Does not appear in Easy mode. Mogu - Mole badnik that pops out of holes in the ground. This page was last edited on 27 March 2018, at 10:59.